Have you heard that October is Virginia wine month? If you follow me on instagram, you probably noticed that I recently visited Virginia Wine country for the first time. This month, the State is celebrating their 29th annual October Virginia wine month and I’m excited to share with you all month long the beautiful wineries and places I visited. I’ll also be sharing with you places to eat, what to do and where to stay while in Middleburg throughout the month. There are so many wonderful reasons to visit Virginia wineries this October; however this month is one of the most beautiful times of the year to visit. This fall you will encounter beautiful scenic foliage sprouting throughout the vineyards, smaller crowds and wine events going on throughout the State, but what makes Virginia wine country unique are the never ending views. Located off the beaten path and just a short 40 minute scenic drive from the nation’s capital, lies beautiful Northern Virginia Wine country. Also known as, “Washington, D.C’s wine country”, the state of Virginia is home to 3,800 acres of vineyards with over 300 wineries throughout the state. Virginia wine country is a rapidly growing AVA with the fifth largest wine growing region in the United States. Virginia is quickly becoming the new hot spot for wine lovers, especially those in the East Coast with one to six hour drives, depending on where they're from. Frequent visitors from neighboring cities and states, are often going to Wine country for the weekend, as a perfect way to relax and escape from the hustle and bustle. Since 1987 Linden Vineyards has been producing wines in the Blue Ridge Mountains. This winery is also recognized as one of the early pioneers in the Virginia wine industry. Jim Law, winemaker and owner, purchased his farm in 1983 with his first vintage producing in 1987. “Never content, always improving”, is how Jim Law defines his vineyards and artisan approach to winemaking. He is an advocate of vineyard designated wines with less intervention. Producing 4,000 cases per year, Linden Vineyards is making wines that are unfined or unfiltered, striving to get as much concentration from the grapes as possible. Their 2016 Riesling was zesty, with light acidity and a refreshing dry crisp finish, a perfect representation of a Linden wine. Read more on my article on Linden Vineyards HERE. Glen Manor Vineyards is a fifth generation family vineyard dating back to 1901, bordering the Blue Ridge Mountains and the common border of Shenadoah National Park. Glen Manor Vineyards is situated along the border of the Blue Ridge Mountains and the common border of Shenandoah National Park. The winery is beautifully nestled at the bottom of the mountains where a glen is formed and mountains with elevations as high as 3400 feet can be seen. Their vineyards are high and steep, with rocky and well drained soils creating one of a kind weather conditions for farming. Their outdoor patio area is calm and peaceful offering breathtaking views of the mountains where the Skyline Drive can be viewed when you look up. It’s also perfect for a glass of winewith a picnic brought from home. You can read my past article on Glen Manor Vineyards HERE. Owner David Greenhill purchased the vineyard in 2013, an exquisite property in the charming town of Middleburg, in the heart of the Northern Virginia. The manor house, which is used as an exclusive tasting room, dates back to 1762. A winery on a property that has been around since 1820. The Hatch family has farmed in Loudoun County since 1950 with their first grapes planted in 2002. Today, they open their home as their main tasting room during the weekends. Legends says, this winery is haunted! With over 35 confirmed spirits!!! The most frequent spirit is Mattie Nixon, who seems to come out when there are people who are about to get married because she didn’t have a great experience. Mattie was married to Dr. William Casilear, a British veterinarian who murdered his farmer for letting the cows out. But there's more to this winery than ghosts. Watch a fun short video on this winery below. You can also read more of my article on this vineyard HERE. Located on 209 acres, Chrysalis was established alongside the banks of the Hungry Run in Loudoun County in 1998. Producing Spanish and French varietals, Chrysalis is the largest producing growers of Norton grapes, a native hybrid of Virginia. This family winery is situated on Hogback Mountain and is one of the largest in the area. Stone Tower family vineyards is a property surrounded by old stone walls and a large pond. This winery has two tasting rooms and several large facilities to accommodate bigger weddings. 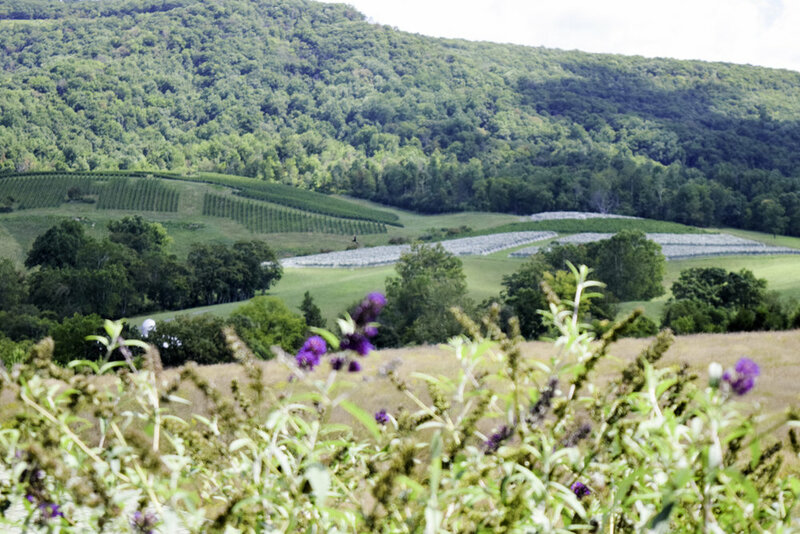 In 2011, the family purchased the 43 acre parcel farm, offering views of the western slopes of the Bull Run Mountains. I will be talking more individually about each winery and their wines in next week’s blog post. You can click here for more information on Wine Pro Tours and their services and different tours. I had the most relaxing experience while staying at the Salamander Resort an equestrian resort in Middleburg. Located on the foothills of the Blue Ridge Mountains, the Salamander Resort is situated close to downtown Middleburg and many wineries that are perfect for couples, families and dog lovers. With exceptional customer service, excellent restaurants, luxurious rooms, an equestrian center and wellness spa treatments, are just some of the reasons locals return to this beautiful equestrian resort for the weekend. Virginia wine month is offering many special events all month long throughout the State. Events such as pop up wine shops, cooking classes, pop up dinners and wine pairings, concerts and so much more. This resort offers something for everyone, including luxury experiences for your dog. Click here for a list of Wine events in October and click here for a list of events at Salamander Resort or look below. On October 14, 2017, stop by Salamander Resort & Spa pop-up wine shop where you will be able to purchase exclusive selections of their rare and hard to find wines as well as sample a wide selection of domestic and internally wines. Learn from the experts at Harriman’s Cooking Studio. This month’s cooking classes include a Pasta Perfection class, Belvedere Mixology class, Champagne and caviar tasting, and Pumpkin Carving. Yappy Hour at Salamander Resort & Spa. Treat your dog and yourself to Salamander’s weekly Yappy Hour! There are obstacle courses for your dogs and a special menu from Gold Cup Wine Bar featuring Sharing Chow including their Pimento Cheese “Hush Puppies” and a refreshing Pup-tail Menu with their Spicy Pup-arita with Blanco tequila. Rent Shinola bicycles and ride through Virginia’s horse and wine country. Stop at a local vineyard, and indulge in a Luxury Vineyard Dining picnic with a local cheese and charcuterie board, country-style pate with house made cherry mostarda, smoked salmon tartar, royal osetra caviar with traditional accompaniments, a bottle of Greenhill Winery‘s Blanc de Blanc and much more. 868 Vineyards Wine Dinner at Salamander Resort. An exclusive four-course dinner prepared by Executive Chef Ryan Arensdorf and paired perfectly with selections from local vineyards in Salamander’s intimate, private dining room at Harriman’s. After spending several days in Northern Virginia, I can now see how Virginia got its motto, “Virginia is for Lovers” and “Virginia is for Wine Lovers”. In recent years, Virginia has proven itself for its wine and taking a huge part in the rise in tourism to the state. With activities for just about anyone, Virginia has demonstrated that there’s more to this beautiful picturesque state. It’s also a place where food lovers can enjoy farm to table dinners or where luxury goers can have a relaxing spa experience. It’s a place for horse lovers to ride through wine country in the foothills of the Blue Ridge Mountains or a place where Wine Lovers can have a glass of wine in the middle of the scenic Virginia countryside. Have you visited Virginia wine country? If so, I would love to hear what wineries you visited in the comments below! ******* This post was sponsored by the Virginia Tourism Corporation in partnership with the Virginia Wine Board. - A special thank you to the Virginia Tourism Corporation, Pro Wine Tours and the Salamander Resort for their partnership.